CWB Chicago: Kim Foxx says Smollett's sweetheart deal is "available to all defendants." Court records tell a different tale. Kim Foxx says Smollett's sweetheart deal is "available to all defendants." Court records tell a different tale. Cook County State's Attorney Kim Foxx says her office treated accused celebrity hate crime faker Jussie Smollett in the same way that ordinary citizens facing similar criminal charges are treated. Is that true? Not so much, according to court files that document what has happened to other defendants who've allegedly filed run-of-the-mill false reports with Chicago police. CWBChicago today pulled Chicago Police Department and Cook County Court Clerk records to see just how comparable Smollett's case outcome is other citizens' cases. The prosecutor who took over the Smollett case when Foxx stepped aside, Joe Magats, said Tuesday that the resolution Smollett enjoys “is available to all defendants; it's not something out of privilege; it's not something out of clout." CWBChicago researchers today located eight recent cases that align closely with Smollett’s. Like Smollett, each of these individuals had no prior adult criminal charges in Cook County. The alleged incidents took place in Chicago and were handled by Chicago police. Each defendant was charged with only one crime: a single felony count of disorderly conduct-filing a false police report (720 ILCS 5.0/26-1-A-4). Smollett was charged with sixteen counts under the same statute. Police alleged that Smollett falsely reported being beaten, doused with bleach, and wrapped in a noose by two masked white men who yelled anti-black, anti-gay slurs while announcing “this is MAGA country.” Associates of Smollett, a TV actor, leaked the story to a well-known gossip website within 10 hours, which put a spotlight on the matter. The ensuing police investigation lasted three weeks and involved the work of at least 12 full-time detectives, according to CPD. Smollett maintains his innocence. Outcome: Unknown. Court file was sealed immediately. Smollett did not plead guilty to any crime. Prosecutors said he agreed to give his $10,000 deposit bond to the city of Chicago. There is conflicting information about whether or not approximately 16 hours spent at the Rainbow PUSH Coalition on March 23rd and 25th was community service and further confusion about whether that possible service was part of the case resolution. Chicago police allege that CT falsely reported that his Audi had been stolen with his 7-year-old daughter sleeping in the back seat. Investigators found that the story was false and CT admitted to lying after receiving his Miranda warning. Outcome: CT pleaded guilty and was sentenced to one-year probation and an unknown number of community service hours. Because he was required to plead guilty, he has a criminal record. Police say DB was the passenger in a vehicle they pulled over for a traffic violation. During the stop, the driver sped off and crashed into a barricade. DB jumped out of the car, ran home, changed into his Chicago Transit Authority uniform, then called 911 to report that his car—the one that had crashed into the barricade—had been carjacked at gunpoint, according to police. Arriving officers were allegedly told by DB that four men carjacked him and two of them drove away with his vehicle. When police told DB that they knew he was lying, he admitted that he was the guy in the passenger seat of the car when it crashed, according to court records. Days to resolution: Ongoing. The case will be a year old on Friday. Police say JA called 911, reported being robbed at gunpoint, and provided officers with a detailed description of the offender. Cops stopped a man matching the description and asked her to identify him. That’s when police learned that the “robber” was JA's boyfriend and that she called in a fake robbery because he cheated on her and she was angry, according to court records. JA further stated that she didn’t think that police would actually take her seriously. Days to resolution: Six months. Outcome: JA pleaded guilty and was sentenced to 24-months probation, two days time served, and fined $804. The guilty plea left JA with a criminal record. Prosecutors said DO reported a false kidnapping. No further details were available in the case file. DO was arrested on the same day that the allegedly false report was made. Outcome: Guilty plea. Sentenced to probation for a year. 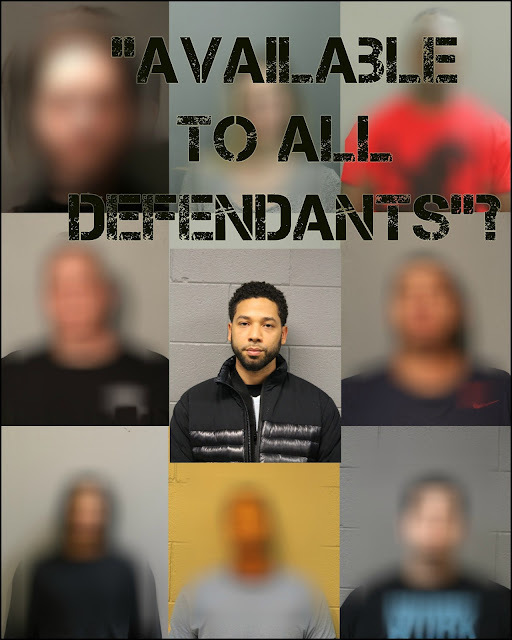 Some dispositions similar to Smollett’s may be found in cases where individuals were charged with a single misdemeanor charge of a similar crime: filing a false report to a public safety agency (720 ILCS 5.0/26-1-A-5). The following cases involve individuals with no prior adult arrests in Cook County who were charged with only one misdemeanor count of false report to a public safety agency. Police said MA falsely reported that he was robbed at gunpoint while taking proceeds from a restaurant that he manages to the bank. Outcome: Pleaded guilty. Sentenced to one year of court supervision. Chicago police alleged AK called 911 and falsely reported that he saw a man drop a gun in a White Castle men’s room. He provided a full description of the man and said the armed offender was standing outside the restaurant, police said. AK later admitted that the report was false, according to his arrest report. Days to resolution: Ongoing. The case is three months old. Outcome: Deferred prosecution, 30 hours of community service. The case is pending. If community service is completed, he will not have a criminal record. DG was accused of telling police that he had been battered by a group of black men who displayed a gun outside of Wrigley Field. Police said they reviewed surveillance video that showed his claim to be false. Outcome: Prosecutors dropped the case after DG completed 20 hours of community service. He was not required to plead guilty. The case has not been expunged or sealed. Some other differences between Smollett's case resolution and the route taken by ordinary people are apparent. Smollett's case was concluded in an "emergency hearing" rather than at his next scheduled court date on April 17th. Particularly odd was the decision to immediately seal Smollett's court record. 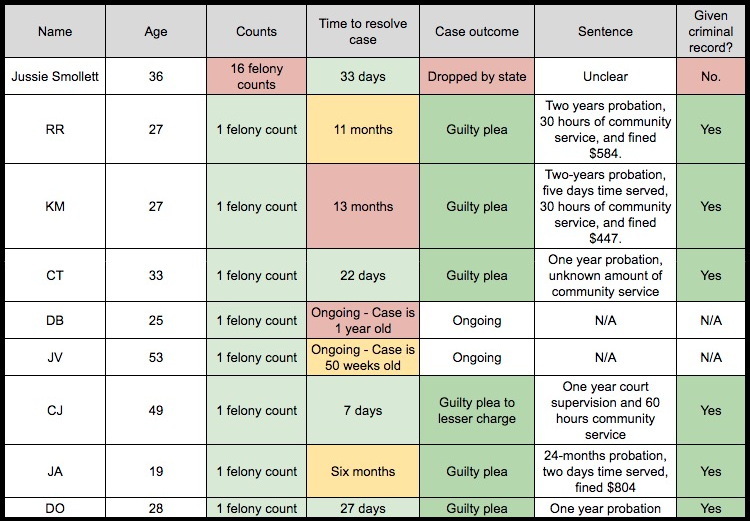 Even when individuals are acquitted of crimes, the court record remains accessible to the public until the individual seeks expungement—a 60- to 120-day process that entities such as the Chicago Police Department have an opportunity to contest. But Smollett's judge yesterday immediately sealed the case, and the case was removed from clerk electronic records within four hours, barring anyone from reviewing the matter. Foxx today said the sealing was an error that would be undone. As of midday on Wednesday, Smollett's case had not returned to the clerk's system. 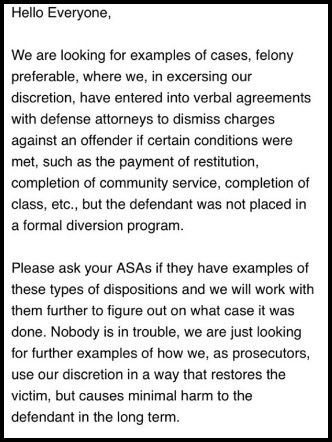 Supervising prosecutors in Foxx's office received the following email on Wednesday afternoon, seeking help in identifying felony defendants who had received treatment similar to Smollett's. We're not sure why the email would be necessary if Smollett's handling has been "available to all defendants." Editor's note: In fairness to the accused parties, we opted to refer to them by their initials only.